If the stoic matador in embroidered golden finery is not the iconic symbol of bullfighting, then only the matador's crimson cape could be. The reality is, the color of the cape means next-to-nothing to the bull -- cows can see only a few colors, and those are typically muted in comparison with the vibrancy with which healthy humans see. Cows are red/green colorblind, which means they see every shade of red and green as a version of gray or black. Cows aren't the only animal with this shortfall -- it's common in horses, dogs and cats, and it's found in a small portion of men. When a matador grabs a red cape, it's the snapping motion of the cape that attracts the bull, not the color. He's probably seeing black with anger, not red. In addition to gray and black, cows see muted versions of yellow and blue. Unlike human eyes, cows have only two color receptors. They won't see all the possible shades of yellow and blue, especially as they lean toward the green spectrum, but their world isn't totally made up of shades of gray. While they're not sensitive to color, cows tend to be sensitive to stark contrasts in color. They spook easily at shadows as well as other objects with sharp contrasts. If your black-painted wood fence stands in front of a white building, the color change right at the cows' eye level can cause them to shy away. Cattle will avoid water when it has harsh reflections from the sunlight. If having calm cattle matters to you, paint as many things in the same scheme as possible -- a dark fence in front of a red barn, for example. 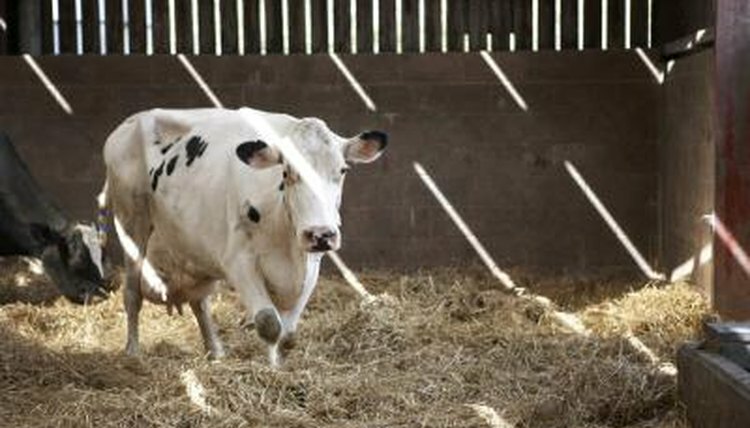 Cows suffer from poor depth perception, which means they can't always tell how far away they are from an object. When they shy away from a moving shadow, they can run right into a fence without realizing they were so close. They can run right into you, too. Be aware of that when you're working around them.